I have previously documented part/predominantly foreign fighter battalions in Syria here, here and here. Below are a couple more groups as part of this series. Logo of Jaysh Muhammad in Bilad al-Sham, with motto reading: "We are victorious or we die." The group's other main slogan is: "The law of God rules us," similar to the mentality of other foreign fighter battalions like theImam Bukhari Battalion of Uzbek fighters. 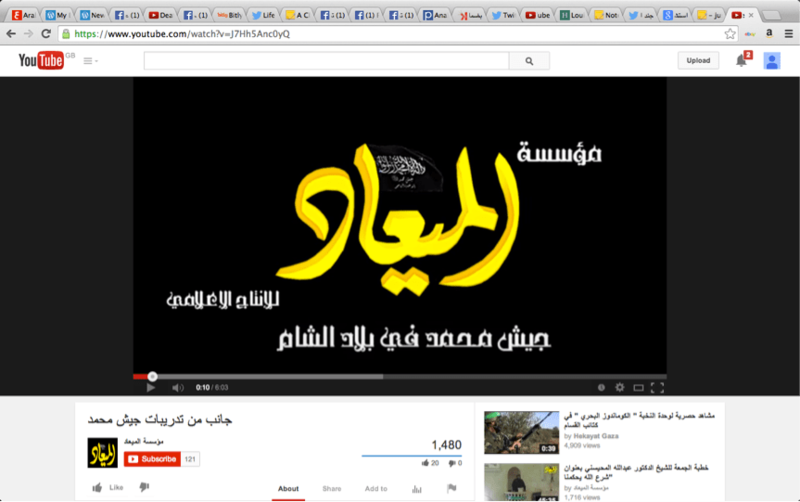 Al-Mi'ad Media, the media wing of Jaysh Muhammad. 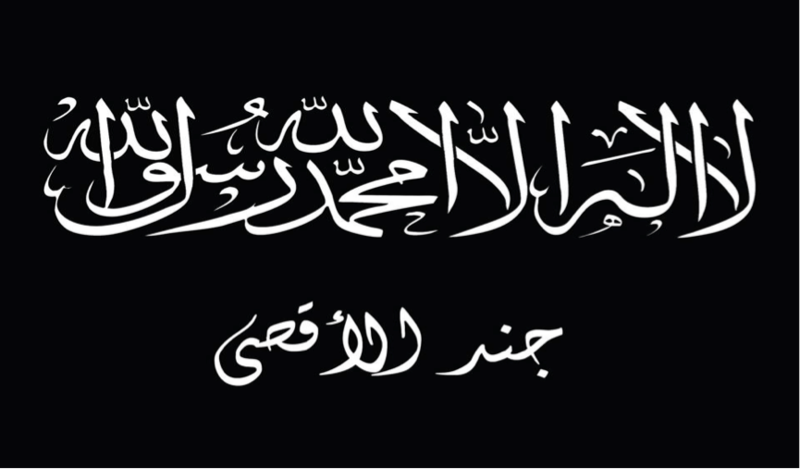 Jaysh Muhammad is a jihadi faction led by one Abu Obeida al-Muhajir (of Egyptian nationality). The group primarily operates in Aleppo province but has extended operations to other governorates: for example, the groupparticipated in October 2013 with the Green Battalion and the Islamic State (IS), among other "Islamic battalions," in an offensive on the Sakhna region in Homs province. In Aleppo province, Jaysh Muhammad worked and co-existed with the Islamic State in some areas prior to and somewhat after the start of wider infighting between IS and other rebels. For instance, in July 2013, a joint operations room as part of "The Battle of True Dawn" was formed in an attempt to capture the two Shi'a localities of Nubl and Zahara' in Aleppo province, including Jaysh Muhammad, IS, Ahrar al-Sham and a local north Aleppo battalion. As for the aftermath of the beginning of infighting in January 2014, the most notable instance of Jaysh Muhammad-IS cooperation came in the "And Don't Separate" initiative- an alliance of jihadi factions including Jabhat al-Nusra and independent groups like the Green Battalion- to capture Kweiris military airbase to the east of Aleppo city. It quickly fell apart though as all battalions except IS withdrew. The most interesting case of IS-Jaysh Muhammad relations was the locality of Azaz, which was seized by IS in autumn 2013 from the FSA-banner brigade Northern Storm. 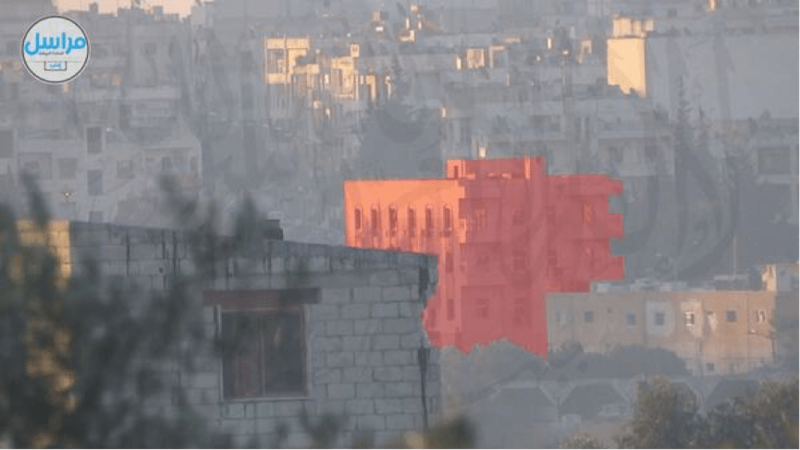 To recap briefly the story of what went on there, IS entered the town of Azaz in the summer of 2013- to the chagrin of some locals- and the group moved into what was a services office to engage in da'wah and social outreach, without initially having a military presence. It was only when IS decided to seize on a pretext to take over the town that fighters and tanks were called in from outside. That said, in a recent interview with me, a spokesman for Northern Storm- which has since returned to become the sole ruling authority in Azaz following IS' withdrawal earlier this year and has formally joined the Islamic Front- affirmed that while Northern Storm and IS had worked together in the fall of Mannagh airbase in summer 2013, IS had been stockpiling weapons seized from the base in what was then its da'wah office. In any event, when fighting initially broke out in Azaz in September 2013, a ceasefire agreementwas mediated by Liwa al-Tawhid and required both Liwa al-Tawhid and Jaysh Muhammad to implement the agreement. It turns out that while Liwa al-Tawhid was nowhere to be seen in the face of IS' subsequent breaking of the ceasefire agreement to expel Northern Storm entirely from Azaz, Jaysh Muhammad had remained in Azaz, having a base there and essentially standing by as IS took over the town. Whereas Liwa al-Tawhid's inaction at the time appears to have been the result of an informalcondemnation of Northern Storm by Aleppo's Shari'a Committee, Jaysh Muhammad more likely did nothing out of jihadi ideological sympathy for IS. What happened in the run-up to IS' strategic abandonment of Azaz at the end of February- considering that the area was cut off from the rest of IS' contiguous territory in east Aleppo province- is also of interest. If we are to believe the testimony of foreign fighter and Twitter personality "Abu Hamza al-Erhabi"- who at the time claimed affiliation with Jaysh Muhammad- then Jaysh Muhammad planned in advance to abandon Azaz if IS left. According to Northern Storm's spokesman in an interview with me, Northern Storm has since imposed an ultimatum on Jaysh Muhammad to leave Azaz, join the fight against IS, or face war. "Jabhat al-Nusra in Aleppo announces that the Jaysh Muhammad battalion under the leadership of the brother Sheikh Abu Obeida the Egyptian- may God protect him- has no organizational connection with Jabhat al-Nusra, for the behavior of the battalion is not considered appropriate in Jabhat al-Nusra's eyes with the maintenance of a relation of brothers, affection and sincerity between us." "In response to the prevailing view regarding the statement of the Jabhat al-Nusra brothers in Aleppo- may God give them strength- and the clarification of the relationship between Jaysh Muhammad in Bilad al-Sham and Jabhat al-Nusra, we clarify the confusion that has arisen: Jaysh Muhammad did not pledge allegiance to Jabhat al-Nusra from the beginning and Jabhat al-Nusra has no pledge of allegiance on the neck of Jaysh Muhammad for it to be understood that Jaysh Muhammad was expelled from Jabhat al-Nusra. But the statement was published on account of what is prevalent among the people: that Jaysh Muhammad is under allegiance to Jabhat al-Nusra on the basis of coordination and cooperation between Jaysh Muhammad and Jabhat al-Nusra: but this is mistaken, for in reality there is joint cooperation and organization between Jaysh Muhammad and Jabhat al-Nusra; moreover, this has not ceased their continuing to be our brothers and beloved ones, and there continues to be a relationship of being brothers in God, affection and sincerity." The current status of the relationship between Jabhat al-Nusra and Jaysh Muhammad is unclear, but arguably as part of the wider trend of non-IS jihadi groups beginning to implement their own state/proto-state legislation projects as territory in Syria is increasingly gobbled up by the regime and IS,[i] Jaysh Muhammad announced in July its intentions of implementing Shari'aand hudud regulations in their entirety in all captured areas. 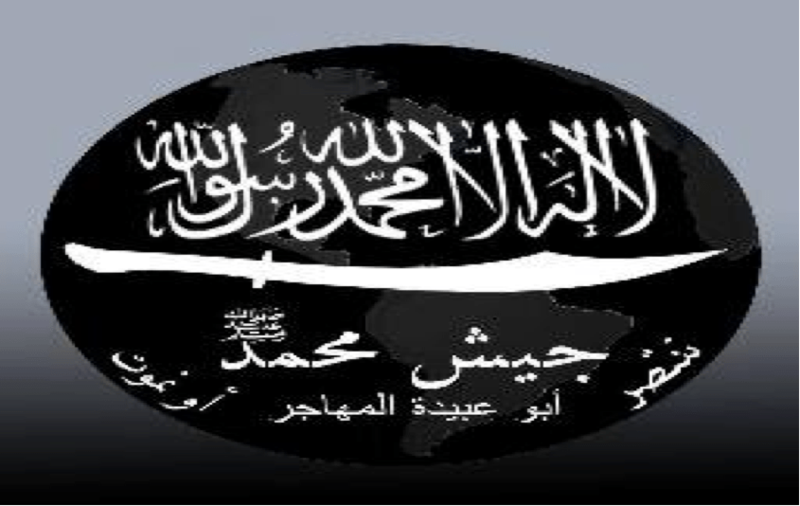 At the moment nothing suggests that Jaysh Muhammad has joined some of the other jihadi groups operating in Aleppo province that formed the Jabhat Ansar al-Din coalition. Update: It has now emerged that despite the Northern Storm ultimatum, Jaysh Muhammad has retained a base in the wider Azaz area (though not participating in any way in governance of the town of Azaz), as the Islamic Front has just released a statement giving Jaysh Muhammad three days to evacuate the Azaz area in light of the fighting against IS. Jund al-Aqsa ("Soldiers of al-Aqsa") is a foreign fighter battalion of a variety of nationalities (including some of South Asian origin)- as well as comprising a native Syrian contingent- primarily operating in Idlib and Hama governorates. The group was in January of this year confronted by rebels on the grounds of being an ally of IS, but with IS' withdrawal from Idlib and Hama provinces, any tensions between Jund al-Aqsa and other rebels have since calmed down, and the group has notably taken part in joint offensives with Ahrar al-Sham of the Islamic Front (e.g. capturing the village of Ma'an in Hama province in February, which culminated in a massacre of local Alawites). More recently, Jund al-Aqsa has been participating with the Islamic Front in an operation to capture Hama military airport: Ghazwa Badr al-Sham al-Kubra, announced last month and ongoing. 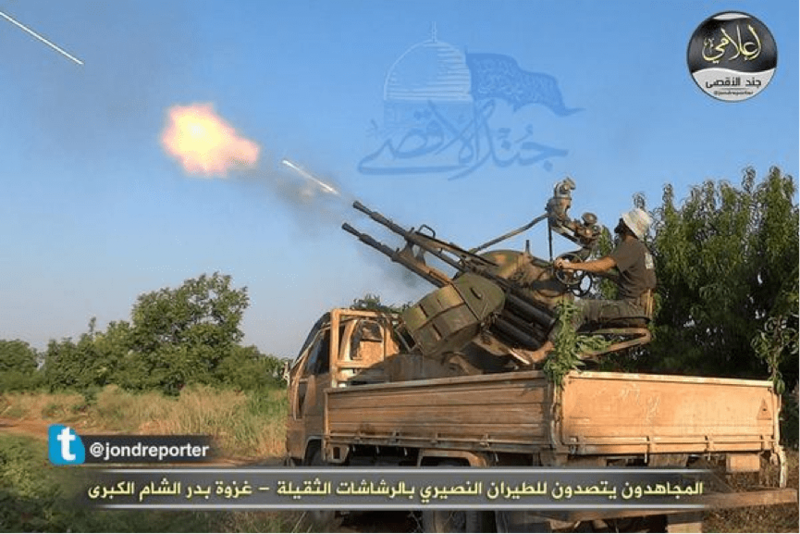 Indeed, it is notable that even as other jihadi groups have set about working on their own administrative initiatives, it is striking that Jund al-Aqsa still remains focused on advertising military operations. 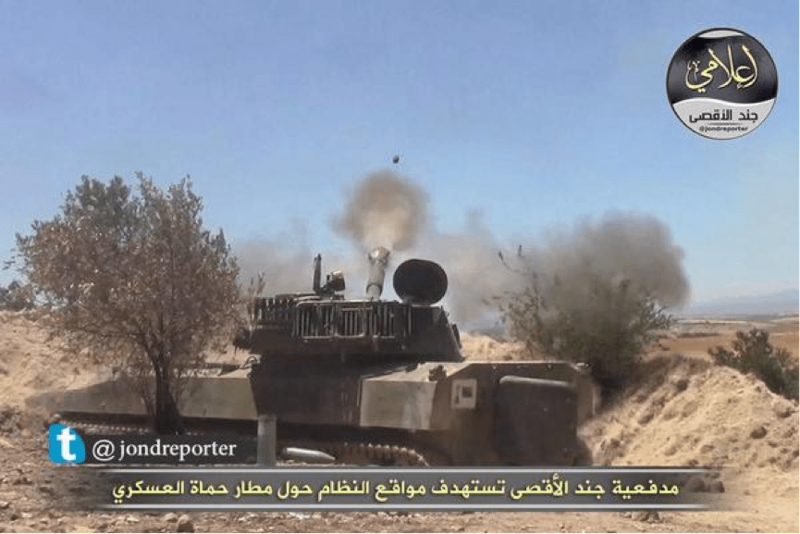 Jund al-Aqsa claiming to fire heavy weaponry at regime aircraft as part of the offensive on Hama military airport. Jund al-Aqsa claiming to target regime positions around Hama military airport as part of the same offensive. Jabhat al-Nusra has also continued to work with Jund al-Aqsa, pointing to Jund al-Aqsa's closer affinity at the present time to Jabhat al-Nusra than IS, whatever the prior relations were with the latter. In this photo released in June, Jabhat al-Nusra claims coordination with Jund al-Aqsa in targeting a hotel building in Idlib city that members of Hezbollah were supposedly using as a base. 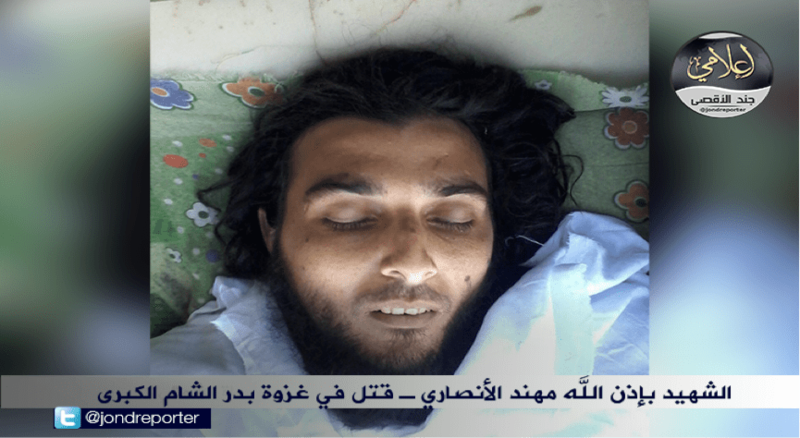 Abu Abd al-Aziz al-Qatari, the amir of Jund al-Aqsa killed in fighting with rebels in January. 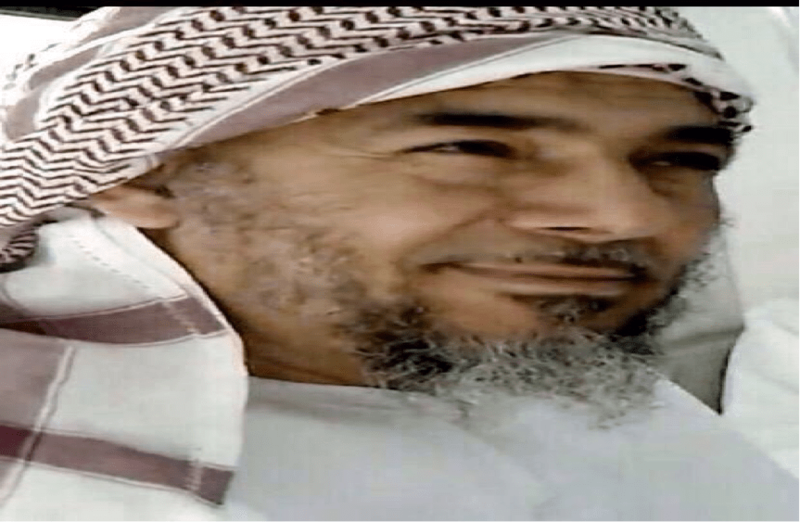 Of Palestinian origin, he was apparently a veteran of the jihad in Iraq for some time before going to Qatar and continuing to support the insurgency against U.S. forces in Iraq. Abu Abd al-Rahman al-Masri: an Egyptian fighter for Jund al-Aqsa whose death was announced on 26 July this year. 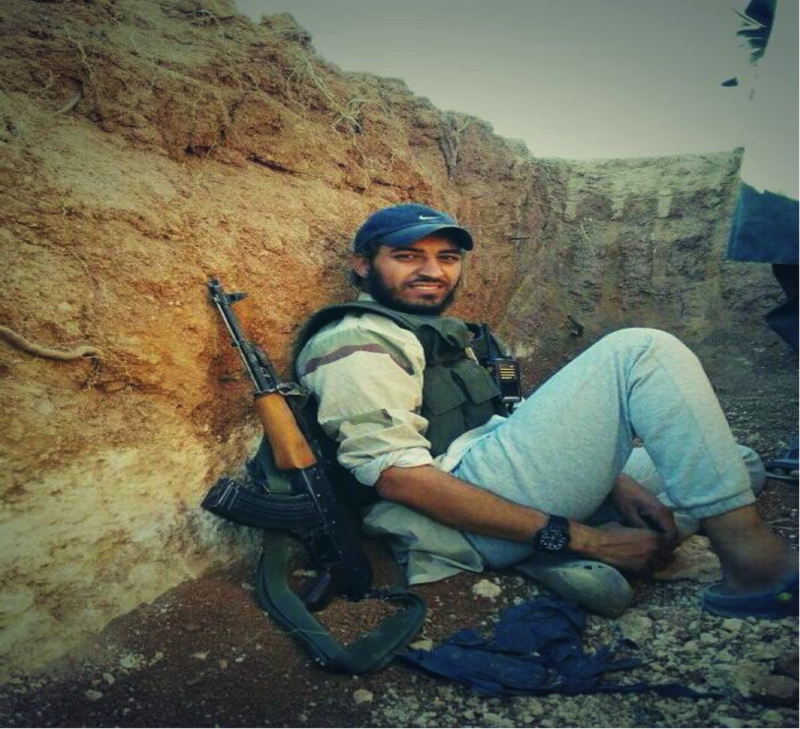 Muhannad al-Ansari, from Saraqeb (Idlib province), killed in the Ghazwa Badr al-Sham al-Kubra. Death announced on 30 July. Undoubtedly too the behavior by Jabhat al-Nusra is partly explained as the result of a perception that some rebels are receiving Western arms on the condition of not cooperating with Jabhat al-Nusra and therefore constitute a threat in the long-run as territory available for control- particularly crucial border areas- becomes increasingly scarce.